(CNN) -- On a cold morning in February, 10 days after undergoing in vitro fertilization, Carolyn Savage lay in bed at her Ohio home waiting for the results of her pregnancy test. 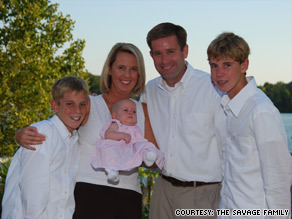 Sean and Carolyn Savage with daughter Mary Kate (now 18 months) and sons Ryan, left, and Andrew. Time was moving slowly. It was getting late and the call from the fertility clinic should have come by lunchtime. "We were waiting and waiting and the call seemed like it would never come," Savage said. Finally, around 4 p.m., Carolyn's husband, Sean, got the call at work. "The doctor told me in one sentence, 'Carolyn is pregnant, but we transferred the wrong embryos,'" he said. "I didn't even know that could physically happen. It was a total shock, totally beyond the realm of possibility." In a tragic mix-up, the Savages say the fertility clinic where Carolyn underwent in vitro fertilization implanted another couple's embryos into Carolyn's uterus. In essence, she had become an unwitting surrogate for another family. After receiving the news, Sean hung up the phone and drove straight home to tell his wife in person. Incredulity turned to shock, and when that shock melted, so did the couple's hope for having another child of their own. At the time, Carolyn was 39 and her chances of having a child naturally after this one were waning. "That was the beginning of a very treacherous and emotional journey for us," said Sean. "I don't think I've ever cried so much in my life," said Carolyn. "It was such a nightmare and, in a way, I felt violated." What happens to extra embryos after IVF? That nightmare was the tipping point on a pregnancy path marred by failed attempts and painful miscarriages. Only the birth of the Savages' first child was easy. Their second child, born almost three years later in 1997, was 10 weeks premature after Carolyn developed life-threatening complications. "That was a scary time for us," said Carolyn. Yet after she recovered, the Savages consulted with a doctor and remained intent on pursuing future pregnancies. It would prove exceedingly difficult. Carolyn and Sean tried on and off for 10 years to have another child before turning to IVF. Eventually, Carolyn became pregnant with the couple's third child, resulting in another difficult pregnancy and premature birth. Their daughter is now a healthy 18-month-old. With five embryos left over from IVF -- and despite the risks to Carolyn's health -- the Savages, guided by their religious beliefs, refused to let the unused embryos at the clinic languish. February 6 was when they thought they had three of their own embryos implanted by the fertility clinic. Cases like these, while tragic, are exceedingly rare, said Dr. David Adamson, a reproductive endocrinologist and past president of the American Society for Reproductive Medicine. "There are well in excess of 100,000 embryo transfers every year in this country," said Adamson. "The fact that this happens once in several hundred thousand embryo transfers means the vast majority of the time, systems do protect from this taking place." Groups like the ASRM have a series of strong protocol recommendations for in vitro procedures, such as accurately labeling embryos with the patient's name and Social Security number, and color-coding samples uniquely to avoid confusion. These identification procedures are not legally mandated, but mistakes can occur if they are not followed, said Adamson. After learning about the mistake, the Savages made two decisions right away: They would not abort the baby, and when he was born, they would relinquish the baby to his DNA parents. "They didn't choose this path either," Carolyn Savage said of the DNA parents, who declined to speak with media. "We knew if our embryo had been thawed and negligently put into another woman, we would expect that the child would be returned to us." The Savages are not releasing the name of the clinic where they underwent the IVF procedure, but provided CNN with proof of their reproductive predicament, including results of amniocentesis, a genetic test, indicating the baby Carolyn is carrying is not theirs. They have met with the baby's DNA parents, and according to Carolyn the DNA-related mother of the child has come along for one doctor's appointment. "We knew based on legal precedent that custody would be lost, and we agree with that precedent," said Carolyn, alluding to a similar case of errant IVF in 1999 in New York in which custody was awarded to the genetic parents. The Savages are grimly aware that they will have to do the same thing soon. Carolyn is now 35 weeks pregnant and expecting to deliver within the next couple of weeks. It is a countdown fraught with mixed emotions. "As the process has gone along, it has been exceptionally difficult imagining this playing out," Sean Savage said. "There are so many ways to walk into that delivery room," Carolyn. "We're trying to mentally frame it instead of a loss -- it is a loss, I don't want to say that it isn't -- but we're trying to look at it as a gift we're giving someone else." The Savages say the five embryos they originally had cryogenically preserved at the clinic in Ohio are still unused and have been moved to another clinic in Atlanta, Georgia. They say doctors have advised against any more pregnancies for Carolyn, so they are working out terms with a gestational carrier, or surrogate, to carry some of those embryos for them. Still, even if a surrogate can eventually help them expand their family, the Savages say that the memory of the child they gave up will always linger. "I know that tug will be there every day wondering if the baby's happy, healthy and OK," said Carolyn. "We want him to know that it wasn't that we didn't want him, but too many people wanted him," said Sean. "We gave him up because it was the right thing to do."